Last time it was Dragons so I felt this was only fair. Chronofang Tiger G's GB1 Soulblasts 1 and binds a rear-guard after he's finished attacking, then you return a rear-guard in the same column as Tiger to the bottom of the deck. ...Nah. Only as the regular Tiger's fail-con as the name is gold, but apart from that this has no place in any other deck. 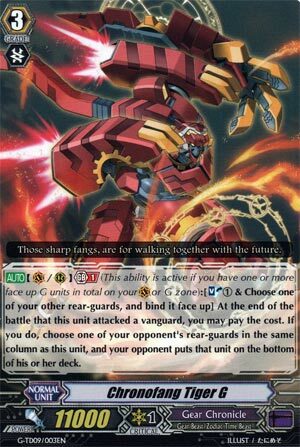 Not even in a ZTB deck I would wager, there are better and more relevant Grade 3s.